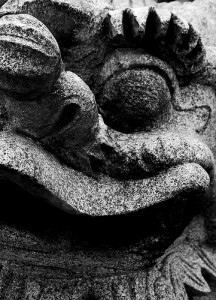 A week ago, Amy Chua, a professor of Law at Yale Law School and mother of two Chinese-American daughters, published an excerpt of her book ( Battle Hymn of the Tiger Mother ) that reflects on her Chinese parenting techniques. The response has been astounding with over 6,000 comments — and not just because of the provocative title the Wall Street Journal chose for it either. Each of the three points assumes a significantly different common ground between parent and child compared to a generalized idea of Western approaches, which means that parents can take entirely different starting points toward shaping their children’s personalities, work habits, attitudes toward difficult tasks, and so on. Eventually something clicked for Lulu and she began to pay the piece correctly – and her exclaims show how proud she was of herself. But here’s where the critics disagree: Is Chua correct in assuming Lulu is “strong enough to take the shaming and to improve from it,” or, as a writer at the New York Times repeats from a detractor, is Chua a “mommie dearest” figure raising a daughter destined for life in therapy? Lots of questions, and lots of variables. Personally, what I think is interesting is parents’ struggle to follow one tradition while living and interacting in another. But I guess this is why Chua clarifies in a later interview that her book is a testament to the trails she went through as a bi-cultural (but Chinese-leaning) mother in a land with different basic assumptions about parent-child relationships. Whether her methods appear sound to us or not, my humble opinion is that we should applaud her attempts at sharing her experiences and reflecting upon them – a sign of good parenting in any culture. I can be a rather skeptical reader — but sometimes more toward readers than authors. I remember the first time I bought a heavily used book for a graduate class. I had taken so long to pick up the play, Thomas Dekker’s 1599 The Shoemaker’s Holiday, that all that was left was a battered copy with more lines highlighted than not. I had the hardest time with that book. I’m usually pretty good (or at least I used to be) at remembering where to find particular passages, but my reputation was seriously damaged with this episode. I could hardly recall where anything was located because I was thrown off by visual markers that, to me, meant nothing and only convoluted how I understood the play. I had no mental pictures of those pages. It was then that I first began judging these invisible readers by how they mark up a book. After the first few pages, if a reader has highlighted what I think is fairly commonsensical, they get thumbs down, and I proceed through the rest of the book skipping any portions highlighted with that same pen. Or, if a person highlights what I would probably notice and shows herself to be fairly consistent about catching the good stuff, then I’ll come to pay more attention to the brightly yellowed portions of the book. Perhaps considerable?! I don’t know what that means — nor how my purchase benefits world literacy when I’m already quite literate, if I do say so myself — but it makes me think how cool it would be if booksellers could explain whether the markings are smart, uninformed, or some other variety. Not that I’d believe them, though. But it would be amusing. I already own a copy of the book this last comment is on. I’m no stranger to highlighting, but I only do so when a book is particularly important to my work and when I expect to own that book for a long time to come. I’ve happily highlighted this copy because I expect it’ll remain mine, but it definitely makes me think about the lifecycle of highlighting. The next time I read this book, I’ll be more informed than the first time or the second or the third time through, so I won’t need nearly as many passages highlighted. 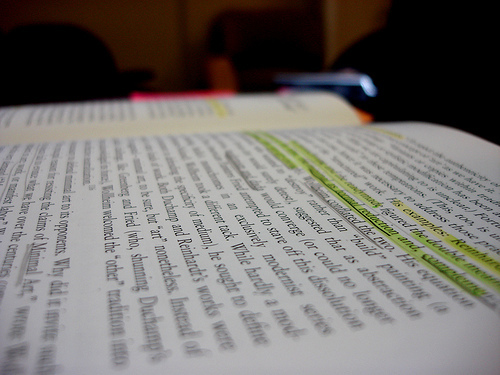 Funny, isn’t it, how highlighting and leaving notes becomes a record of your intellectual status at the time of your reading? These days I always highlight for a particular purpose. And it’s possible that neither I nor anyone else will ever match that exact purpose again. With time being a luxury I don’t have these days, I read for particular types of information rather than to piece together the trajectory of a book. It makes me think I’ll be (actually, I probably already am) one of those people who when asked to lend a book quickly shuffles through the pages first to see if there are any stupid comments that might ruin my credibility. Because I, too, will be judged. Alas. Um, not quite as much as it used to be? But if by popular usage extreme now refers to qualities that are just a few measly degrees beyond the norm, then what do we use in its stead? Enter UrbanDictionary.com. (They know everything.) Of course, the site wouldn’t even have an entry for something as boring as extreme or extremely, but – get this – they’ve got extremliest! 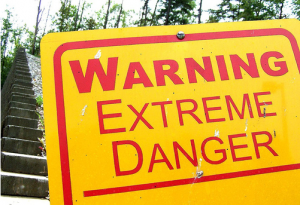 A user defines the word as “more extreme than ever, used when u need to express an outrageous amount of extreme-ness.” Uh, right. That’s totally extremely clear. My only conclusion is that some words appear to lose power with younger generations. I use awesome fairly frequently but rarely because I’m struck with awe. On occasions of awe, I might say something like whoa, which, to be honest, doesn’t add much to a conversation — so maybe I shouldn’t complain after all. If extremeliest is now required to evoke the same response that extreme used to bring, I suppose it’s kind of like the more mainstream ginormous substituting enormous. Nonetheless, I can’t guarantee I’ll be saying extremeliest any time soon. Alas. 50 Extremely Useful PHP Tools: I suppose it’s relative. Extremely Green: As in the color of spinach versus the color of celery? Meh. 55+ Extremely Useful Online Generators for Designers: Seems techy folks have a liking for “extremely useful” stuff. 30 Extremely Elegant Serif Fonts: An oxymoron? Isn’t “elegance” based on a culture’s aesthetic norms? Extremely Smart: Clever, but the site needs a wee bit updating to keep pace with its name. * My browser showed “hyperaware” as being misspelled, so I Googled it to make sure the combined form is a word. Ironically enough, hyperaware is defined at Wiktionary.com as “extremely aware.” Ha! I’m amused. 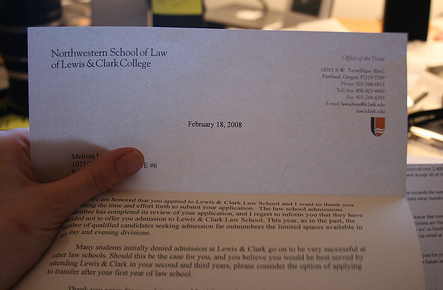 The Wall Street Journal just published an article about colleges and their rejection letters: “Rejection: Some Colleges Do It Better Than Others.” It’s a gives an interesting report on recent discussions on CollegeConfidential.com where college-bound students have shared details about the letters they received. I was struck by one example. Admissions at Boston University tried (it would appear) to soften the blow by stating they “give special attention to applicants whose families have a tradition of study at Boston University.” But as one student responded, for someone who was attempting to follow his family tradition by attending the school such a comment wasn’t comforting at all. Quite the opposite in fact. It’s always interesting when a message can be understood so differently from how the author(s) intended (yes, I know, I should stay away from the “intentionality” quagmire), and I do wonder if the letter writers were aware of how that line could be understood. But this example also reminded me of an opposite situation, one in which excessive celebration had others hang their heads down in shame. Okay, I’m exaggerating, but I do remember hearing a thank-you speech that had enough superlatives for those who had helped in the project to make others who hadn’t worked on the project fidget uncomfortably in their seats. Ouch. My, my. Nothing like economic turmoil to wreak havoc on what a society thought it knew. A Times article, “Can Marijuana Help Rescue California’s Economy” by Alison Statemen, reports that California is revisiting its strict rules on medicinal marijuana to consider whether the cash crop could help straighten out a bad economic situation. Apparently there’s enough money in the economy — it’s just a matter of what people are (not) spending it on. Another reason lawmakers are reevaluating legalizing marijuana is that it would result in the decrease of arrests, prosecution, and imprisonment, saving the state as much as $1 billion a year, Statement writes. I’m really quite surprised, but I don’t know that I should be. Quite a bit would change and for the same reasons that some things have not. Smoking bans won’t result in a move toward outlawing cigarettes any time soon because the government makes a killing on taxing the item. Further, I’m sure a lot has been learned from the U.S era of alcohol prohibition. The country decided that profiting off alcohol consumption was better — economically — for the country than policing it’s illegal trafficking. If history repeats itself here, gone would be a black market and in would come flood of income in proper capitalist fashion. In a rhetorical sense, one of the most interesting results would be a partial collapse of the War on Drugs. It could change quite a bit of what the nation stands for and how it continues to portray its surpriority in global terms. I don’t want to run too far ahead with this idea, but the change could be huge. In a time when the country has just finished a two-term presidency that resulted in a substantial rise in unfavorable feelings toward the country, I wonder how the doxa of the nation and the globe would change as a result of a change like this one. Difficult times can change just about anything, it seems. Let’s wait and see what happens. Throughout a heady election season, the conclusion of a divisive administration, and an inauguration that attracted a record 1.8 million people to Washington D.C., American presidents and presidential hopefuls have performed a flurry of persuasive acts, some stilted, some eloquent, some mangled, some unintentional, some iconic. What have been the most pivotal moments in American politics in the last year? What stood out, made you laugh, made you yell, made you think? What conversations should the nation — and the world — have as we move forward? We welcome short contributions of 500-750 words or video/audio productions of 1-2 minutes (or any combination thereof) that explore an issue or phenomenon you think is stimulating, amusing, or uncomfortable — as long as it is insightful. Submissions are due by Monday, March 2, 2009. I can’t help but feel it’s embarrassing the U.S. media has slighted its outgoing president. Sure, his approval ratings are quite low, and sure a pilot crash landing on the Hudson River was riveting news, but I’m still surprised the major media outlets largely cut directly to and then directly away from President Bush’s farewell speech without giving much build up or much conversation afterward. Even this Time‘s piece from November 2008 says it’s “the nature of mainstream journalism to attempt to be kind to Presidents when they are coming and going but to be fiercely skeptical in between,” and yet this article is anything but kind and celebratory. Googling “Bush” and “farewell address” shows an odd listing: The second hit is Ariana Huffington’s piece, “Bush’s Farewell Address: Still Delusional After All These Years,” which is anything but a charming look at Bush’s legacy. Even knowing the current atmosphere is not in Bush’s favor, I’m surprised the article ranks so high. The eyes of the country are certainly looking forward, but it’s worth taking a look at how President Bush has been packaging the remaining days of his presidency. I can’t seem to remember where I read an article about the Bush administration working hard since the election to paint a flattering picture of the president, but it seems true. Bush gave a record number of interviews, and I recall reading a behind-the-scenes look at a day in the life of Bush, and the picture was flattering. I was watching CNN when I heard one commentator call Bush’s performance “pathetic.” They are really giving him no love. The speech contains some of the usual (see the transcript here) — gratitude for having served, a positive look toward the past, an optimisitic look toward the future, and honor expressed over remaining an American citizen (though I am surprised how close line echos President Clinton’s farewell speech: Bush said, “It has been the privilege of a lifetime to serve as your President. [. . .] I have been blessed to represent this nation we love. And I will always be honored to carry a title that means more to me than any other – citizen of the United States of America,” while Clinton said, “In the years ahead, I will never hold a position higher or a covenant more sacred than that of President of the United States. But there is no title I will wear more proudly than that of citizen”). The speech also held some unusual moments, like the inclusion of American citizens and their individual stories, a touch that is reminiscent more of state of the union addresses than farewell speeches. As the years passed, most Americans were able to return to life much as it had been before 9/11. But I never did. Sadly, what followed didn’t build up on the emotion of the statement. The job of the president can be a lonely, harrowing experience. Some more humanity and humility in the president’s words and demeanor would probably have the media — and the public — respond more sympathetically and respectfully to a departing United States President. 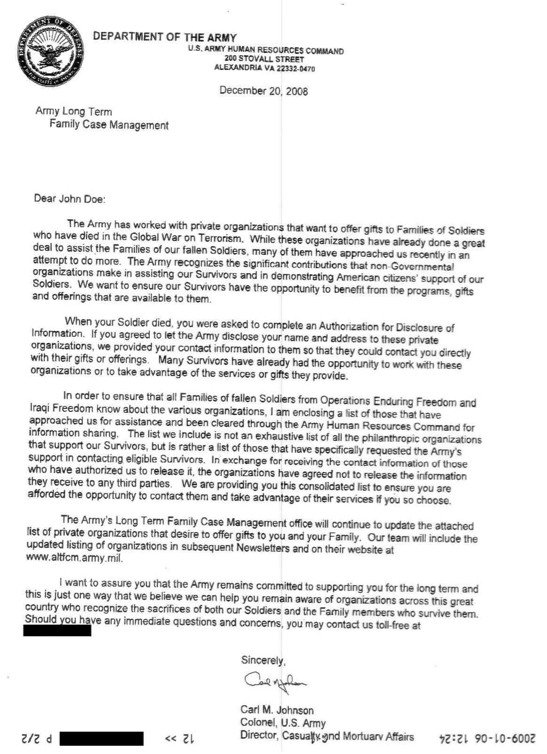 In the news yesterday, the U.S. Army apologized for 7,000 letters sent to the surviving families of deceased soldiers who fought in the present Iraq war. Apparently the contracted company suffered a printing problem where the placeholder salutation, “Dear John Doe,” was not properly replaced with the recipients’ names and titles. Ouch. 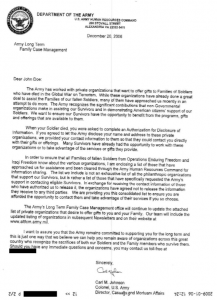 The letters were meant to notify the fallen soldiers’ families of services or gifts they could receive from nonprofit organizations. I don’t bring up this story to poke fun at the U.S. Army for this mistake — it’s much too sensitive an issue — but I wonder how the recipients must have responded to the letters. The Army has supposedly sent out an apology, but I can’t seem to locate it. You can read their press release here. I am reminded of two related stories. One is admittedly minor and even silly in comparison, and the second is one that comes with the gravity of history, great loss, and a way with words from an important man. On November 5th, 2008, I received an email from JetBlue, the cool, fresh airline I frequented back when I lived near a city it serviced. Now I simply ignore their emails until I move again (from what I could see, they don’t seem to have an easy way to delete one’s account without contacting customer service — very clever). The critic in me, however, can’t help but open these emails to see how companies represent themselves these days, and I certainly had a moment when I opened this particular email. I am addressed as “Mr. Soandso.” Huh. My mind quickly did a few loops at the time, the first beginning with the technology problem and then ending with questions regarding the company’s views of its customers: (1) obviously an improper or mistakenly forgotten link to the database caused the problem; (2) the placeholder doesn’t sound nearly as cool as JetBlue markets itself; (3) people actually use “soandso” these days? (4) why am I a Mr.? (5) I can’t believe I’m a Mr., especially a Mr. Soandso; (6) what general image must they have of their customers? Somehow I really got put off at the idea that JetBlue thinks of me as “Mr. Soandso” rather than a “Dear Jetsetter” or even something as innocuous as “Dear JetBlue Customer.” (JetBlue sent out an apology within an hour or more of the error, but it appears I didn’t save the email.) To be honest, I’m really surprised at how much I was bothered over the “Mr.” From what I understand of technology, a placeholder doesn’t need more than a single character to tell the software where to insert the proper data. Adding the gendered title, if I’m correct, would be unnecessary. In my mind, then, it really says something about who the heads of the company think they’re servicing. A quick aside: I’m reminded of an old classmate who would write “snazzy title here” at the top of her academic papers when she couldn’t come up with a title. She shrugged and looked a bit embarrassed the first time I noticed it, but I loved the idea and still do. It evoked such a positive feeling about the work: By intending to write a really snazzy title, she meant she intended to write a really snazzy paper as well. How else to get a graduate student pumped about writing a seminar paper? But if Jetblue thinks I’m simply “Mr. Soandso,” they don’t think I’m snazzy at all. When I imagine the character they construct to represent the target audience of their marketing materials, I can only picture shiny shoes, a suit, and tie. A business man. Am I taking this slip personally? No. But I feel like I’ve been given an accidental glimpse into the company. It’s like taking a peek into a restaurant’s unkempt kitchen and realizing why some people in the business tell us we’re better off not knowing what goes on back there if we want to continue enjoying the luxury of eating out. Alas, I am making too big a deal about this particular story, but I’m doing so to make a larger point: If I could read so deeply into a human and/or technology failure in a case where nothing more than my ego and consumerism are at stake, I can only imagine (or, honestly, perhaps I can’t) what it must feel like to receive a letter regarding the death of a family member and be addressed so coldly. The letter and the (now inaccurate) storyline may be familiar to those of you who have seen an adaptation in the film, Saving Private Ryan. 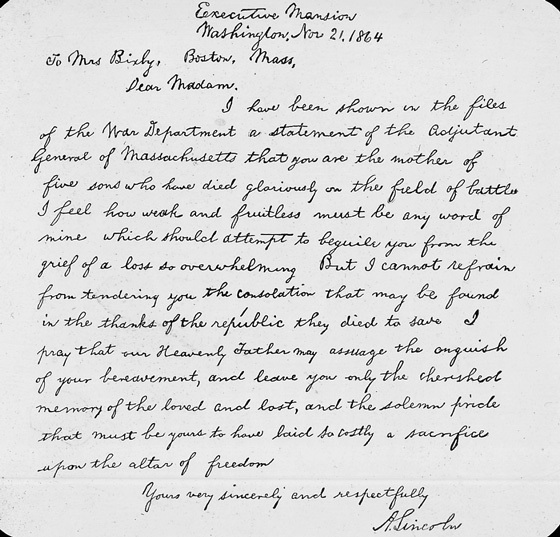 How sad to think that such a deep apology was (apparently) promptly destroyed by the receiver, for the mother was sympathetic to the South rather than to the views Lincoln held. I wonder how the “Dear John Doe” letter was received today — even if it’s not the letter that actually breaks the news — if over a hundred years ago a mother and citizen could so decidedly disregard a personal letter from the President of the United States of America.